Make math centers engaging and easy with this differentiated math game! 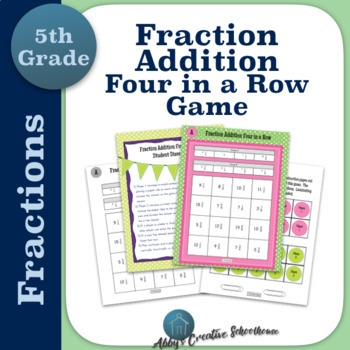 This set of partner games allows students to practice adding fractions. The game includes printable student directions for each level, game board, and game pieces. *This updated version now includes full color and black and white options, as well as answer keys for game boards. * Chips or colored squares could be used instead of the printable game pieces. It is highly recommended to laminate the game board or print on cardstock for extended use! Students continue to add mixed numbers until one player reaches four in a row horizontally, vertically, or diagonally. Great for use with partners, small groups, and in centers! Assign levels to particular students for scaffolding or a challenge. Are you planning to teach or review subtracting fractions as well? Consider purchasing this game as part of my adding and subtracting games bundle and save over 10%!